How come doing the right thing for the environment is often not the smart economic choice? Why does it feel like most people are falling further and further behind economically, despite machines doing much of the hard labor these days? Is there another economic system that would allow people to live their values? 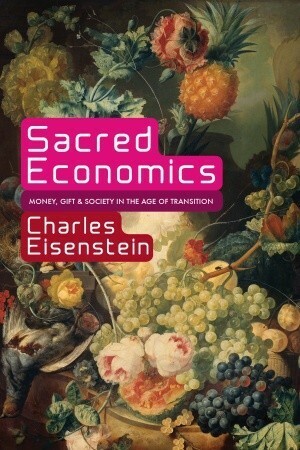 Charles Eisenstein asks and attempts to answers these questions in his intriguing book, Sacred Economics. Eisenstein assumes his reader knows nothing about economics and patiently explains the history of money and how exactly our current economic situation works—pointing out both the value of this system and the many problems and side effects it causes. He goes over what we’ve been taught are the “rules” of economics and neatly points out, one by one, how these “rules” aren’t real. They’re all made up and are only true because we as a society let them be true. Eisenstein then focuses on the problem with interest-based loans and points out how this particular “rule” of always having to get bigger harms our society and has caused much of the inequality we have today. He explains in great detail how interest-based loans are the driving force behind climate change, lower worker wages, and the general hamster-wheel life most people feel trapped by. Does Eisenstein make good on his promise? Yes and no. He does lay out a plan for realigning our economic system so it works better for most people. Much of his plan has to do with getting rid of interest, putting some kind of expiration date on money to deter hoarding, and tying the value of money to the health of the earth, rather than the gold standard. He goes through each point carefully, explaining how the current system works, and what kind of new system might take its place. While the new ideas are intriguing and worth reading about, Eisenstein does not concretely describe how his most intriguing idea—tying the value of money to the health of the earth—would work in concrete terms. By the end of the book I did not feel like I knew exactly what my role was in changing things either. I did however have a much better understanding of how money works and why our current economic system works so poorly. I was also introduced to some very cool ideas about how we as a society might change things, which for me was worth the time it took to read the book. This entry was posted in Uncategorized and tagged 3.5 stars, books, non-fiction, reviews by rowenaeureka. Bookmark the permalink.